This richly colored cloud of gas called RCW 34 is a site of star formation in the southern constellation of Vela (The Sails). 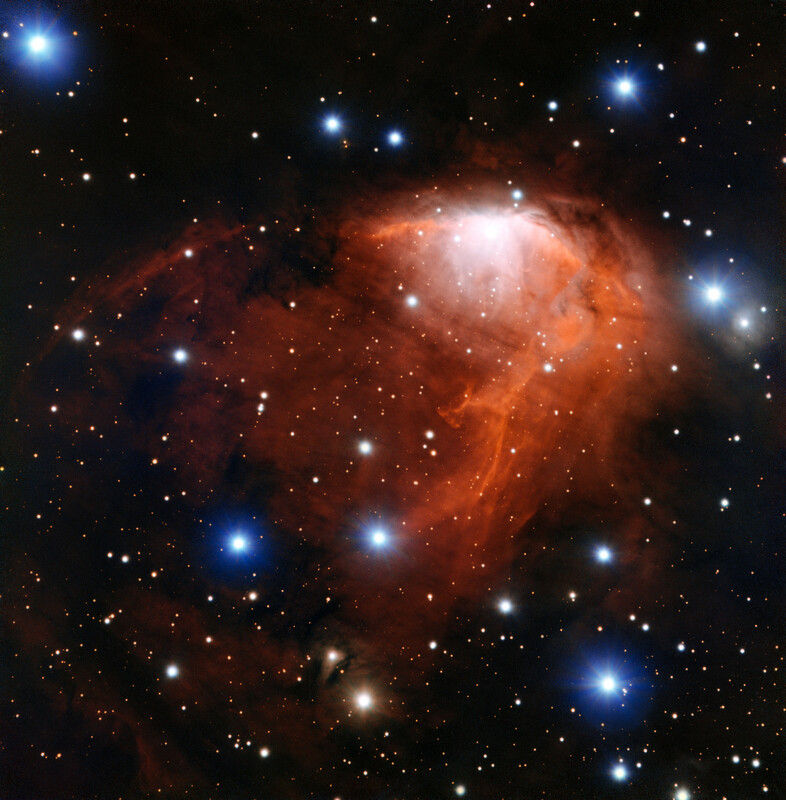 This image was taken using the FORS instrument on ESO’s Very Large Telescope in northern Chile. This newly released image from the European Southern Observatory shows the young star-forming region RCW 34. In the brightest region of this glowing nebula called RCW 34, gas is heated dramatically by young stars and expands through the surrounding cooler gas. Once the heated hydrogen reaches the borders of the gas cloud, it bursts outwards into the vacuum like the contents of an uncorked champagne bottle — this process is referred to as champagne flow. But the young star-forming region RCW 34 has more to offer than a few bubbles; there seem to have been multiple episodes of star formation within the same cloud. This new image from ESO’s Very Large Telescope (VLT) in Chile shows a spectacular red cloud of glowing hydrogen gas behind a collection of blue foreground stars. Within RCW 34 — located in the southern constellation of Vela — a group of massive young stars hide in the brightest region of the cloud . These stars have a dramatic effect on the nebula. Gas exposed to strong ultraviolet radiation — as occurs in the heart of this nebula — becomes ionized, meaning that the electrons have escaped the hydrogen atoms. This video gives a close-up look at a richly colored cloud of gas called RCW 34, a site of star formation in the southern constellation of Vela (The Sails). 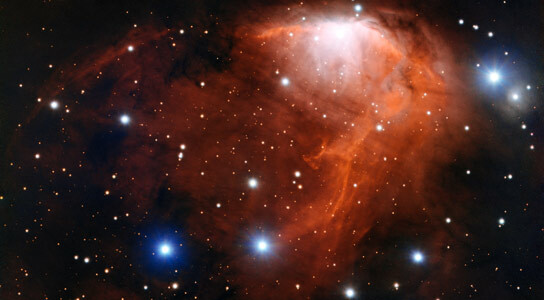 This image was taken using the FORS instrument on ESO’s Very Large Telescope in northern Chile. Hydrogen is treasured by cosmic photographers because it glows brightly in the characteristic red color that distinguishes many nebulae and allows them to create beautiful images with bizarre shapes. It is also the raw material of dramatic phenomena such as champagne flow. But ionized hydrogen also has an important astronomical role: it is an indicator of star-forming regions. Stars are born from collapsing gas clouds and therefore abundant in regions with copious amounts of gas, like RCW 34. This makes the nebula particularly interesting to astronomers studying stellar birth and evolution. Vast amounts of dust within the nebula block the view of the inner workings of the stellar nursery deeply embedded in these clouds. RCW 34 is characterized by extremely high extinction, meaning that almost all of the visible light from this region is absorbed before it reaches Earth. Despite hiding away from direct view, astronomers can use infrared telescopes, to peer through the dust and study the nest of embedded stars. Looking behind the red color reveals that there are a lot of young stars in this region with masses only a fraction of that of the Sun. These seem to clump around older, more massive stars at the center, while only a few are distributed in the outskirts. This distribution has led astronomers to believe that there have been different episodes of star formation within the cloud. Three gigantic stars formed in the first event that then triggered the formation of the less massive stars in their vicinity . This video sequence takes the viewer from a broad view of the southern skies deep into the constellation of Vela (The Sails). Many glowing gas clouds are seen, including some of the strange blue filaments of the Vela supernova remnant. The final image shows the star forming cloud RCW 34 in a very detailed new image from ESO’s Very Large Telescope in Chile. RCW 34 is also known as Gum 19 and is centered on the brilliant young star called V391 Velorum. The most massive very bright stars have short lives — measured in millions of years — but the less massive ones have lives longer than the current age of the Universe. Be the first to comment on "ESO Views Star Forming Cloud RCW 34"